Read the Appendix if you are concerned about what you can do to protect your children's health from our toxic environment. Philip Shabecoff is an environmental writer based in Massachusetts. He was a reporter for the New York Times for more than 30 years, and founded the online environmental news service Greenwire in 1991 and served as its publisher until 1996. Alice Shabecoff served in the 1970s as executive director of the National Consumers League, the country’s oldest consumer organization, and in the 1980s as founder and executive director of the national nonprofit Community Information Exchange, an information service for the community development sector. As a freelance journalist focusing on family and consumer topics, her work has appeared in The New York Times, The Washington Post, The Christian Science Monitor, among other publications. She currently serves as a member of the Board of Directors of the Birth Defects Research Center. There is a country in which nearly one in three children suffers from some type of chronic disease and whose childhood cancer rates have risen some 67 percent in the last 50 years. What is this country doing wrong to cause so many of its children such suffering? 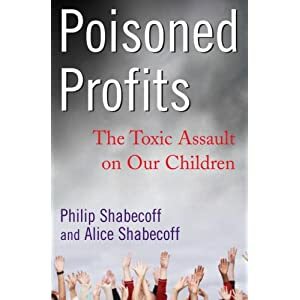 The country is the U.S., and the Shabecoffs, nationally known journalists, believe they know exactly what is causing our children so much illness. Sure, they say, lifestyle choices (bad diet, secondhand smoke, etc.) can account for a certain amount of ill health. The real malefactor, however, is greedy American industry, aided and abetted by a shortsighted economic system and a government that turns a blind eye when faced with damning scientific evidence of true crime—the crime of knowingly poisoning children, beginning when they are the most vulnerable: in utero.